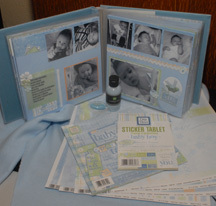 You may have the best selection of the most beautiful and versatile products in the scrapbooking world, but if your customers can’t picture it in their own albums and projects, it can end up languishing on your shelves. Take the time to make up sample pages using products sold in your store. Do this for both new and old stock. Samples will increase interest in the hottest new lines, and revive interest in older ones. If you don’t have time to do this yourself (because you’re so busy with your now-bustling shop! ), have your employees make samples during down time. You can also strike an agreement with regular, skilled croppers to do sample pages. Perhaps they’d be happy to make all the samples you need in exchange for a modest store discount. Similarly, if your store offers a class featuring a specific product line, don’t just file the pages away after the class is over. Put them on display near the product! You can set them on shelves, hang them on the walls or whatever you see fit.